We are all friends here, right? So I am going to be honest with you, since having Felix it has been hard getting back into the swing of recipe writing and posting. I mean I have many new recipes to share with you. They are even photographed. The problem is finding the time (and energy) to edit photos and write up posts. BUT I am determined to get back into the swing of things because I miss you and I miss sharing food with you. Last month on my Facebook page Mary asked for this recipe. I love taking requests. In fact making people something that I know they will like makes me the happiest. 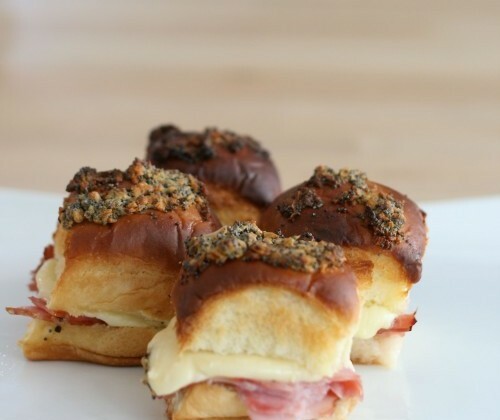 I set off to work in the kitchen right away whipping up these sandwiches. Today I am finally sharing them with you! Have you seen those Kings Hawaiian rolls in the grocery store? They are the ones in the orange packaging. 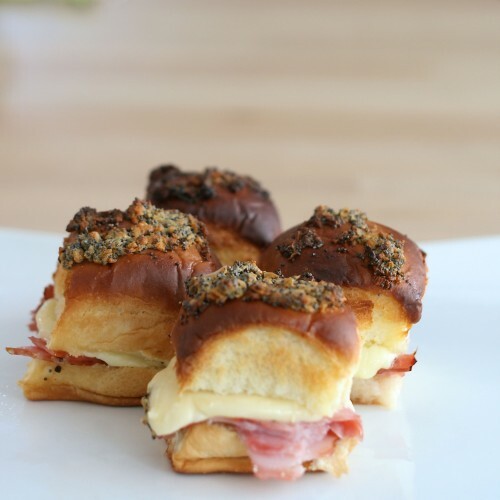 The slightly sweet roll pairs so well with the salty ham. Traditionally they are made with Swiss cheese but I made half my sliders with havarti cheese which melts really well and isn’t as strongly flavored as Swiss. Preheat over to 350 degrees F. Grease a 9x13 baking dish, set aside. Slice rolls in half. Place bottom half of rolls in baking dish. Top each bottom half of roll with one slice of ham. Fold the ham in half or quarts to fit the roll. Top each ham slice with half a slice of cheese folded in half or quarters to fit the roll. Place the top half of roll on the sandwich. In small bowl mix together remaining ingredients (butter, dijion, worchestershire, poppy seeds, and onions) Pour mixture evenly over rolls. Bake for 15 minutes or until cheese is melty. What a delicious looking recipe! I’m sharing this on Google plus.